On Wednesday January 21st we continued filming for our documentary City Rooftops This time we talked with architect Luuk Verlint at his drawing table. He is the architect behind the drawings of the 2000 square metre roofgarden. Having done hundreds of roofgardens with the innovative team at De Dakdokters, this particular project is one of his grandest designs so far and is unique. Besides fruit, vegetables and various herbs, B's roof has a beach, barbeque spots and two lanes for "jeu de boules" to name some key points. Rooftops as these are what Luuk calls the "green lungs of the city". They can bring back some of the uses of land from the ground that was acquired for city buildings. More recently De Dakdokters are finding ways to use roofs for water retention to help cities manager their waterflow when there is a lot of rain. Amongst others, Luuk Verlint shared about the fluidity of design process. It started off with post-it notes and sketches. Later more detailed drawings and visits followed hand in hand until the plan was finished. In terms of filming, as much natural light as possible is used as a key light. A low energy fill light is added later on. Concerning sound, two microphones were used for the interview, in case one microphone fails. Benny Vink and Luuk Verlint alongside the architects drawing table. Luuk Verlint and Benny Vink reviewing captured footage. microphone, camera and fill light. Luuk Verlint showing Benny Vink A0 size drawings. Picture of B Amsterdam's roof in November 2014. Note the beach in the centre and the "jeu de boules" lanes to the left. 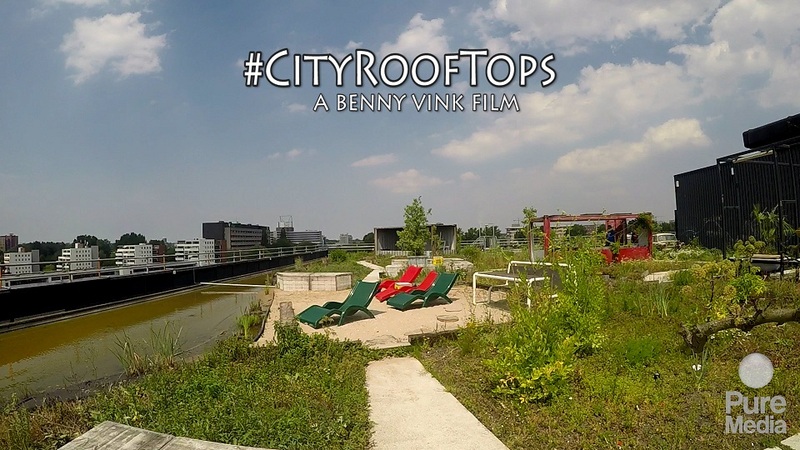 Benny Vink Filming B Amsterdam's roof in November 2014. Benny Vink filming Luuk Verlint as he shares about the drawings. Several drawings by Luuk Verlint.